Cuneiform texts found on clay plates in Mesopotamia tell us about an extraterrestrial race, called the Anunnaki, who came from space to exploit our planet. Through genetic manipulation, they created modern humans from existing earthly life forms to serve them as slaves. They physically left our planet millennia ago, but as Sigdell reveals, their influence and control over humanity is still pervasive and significant. The author reveals how the highest creator sent a messenger called Jesus to expose the Anunnaki and show us a way out of their matrix of control through a spirituality based on love, empathy, and sacred sexuality. But the “god” of the Anunnaki defeated this messenger and replaced him with a false Christ. This led to the development of Paulinian Christianity under Anunnaki influence, as well as other parallel religions such as Islam, and the suppression and elimination of the original Christianity, Gnostic Christianity. With the discovery of hidden Gnostic texts and teachings at Nag Hammadi in 1945, the way is now paved for our release from the reign of the Anunnaki. 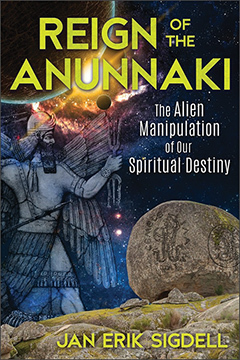 REIGN OF THE ANUNNAKI: The Alien Manipulation of Our Spiritual Destiny By Jan Erik Sigdell. 160 Pages. 6x9 Paperback. Illustrated. Bibliography. Index.